Boxed/clipper with lead and plug/spare carbon brush and spring/oil/instruction manual. 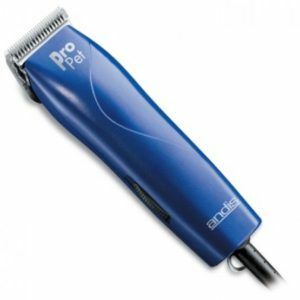 PLEASE NOTE This clipper is supplied by the Manufacturer WITHOUT A BLADE. CONS: Dated and with reported overheating problems! Overtaken by almost every manufacturer producing similar machines. 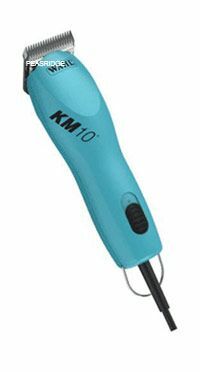 Supplied without a blade..
Years ago this along with the single speed model was the “benchmark” of the professional dog groomer's clippers used worldwide in grooming circles. However in a market driven by technological innovations both time and the manufacturing “competition” not only caught up but in many cases – they cruised past! Reported overheating problems have not helped the situation either! With growing discontent of the overheating problems and the availability of other often better machines their market status has been badly eroded. Other than the casing colour, the option of two speeds and a few of the internal spare parts, plus the price this model is very similar to the single speed. Despite the problems of overheating and becoming increasingly more dated as the years pass, one has to recognise that they are still used in their thousands in many countries around the world. Reasonably lightweight and compact, the handpiece is not as slim or as comfortable as others are in its class. The powerful 35-watt motor is designed to cope with all parlour-clipping tasks. Blade attachment is a crisp and smooth operation, with few problems with the latch assembly. The newer models have introduced double side air filter ventilation, no doubt as an attempt to reduce existing over heating problems. Potential customer should note that Oster clippers are generally always sold without a blade. We are informed it is done this way because whatever blade was added would not suit all needs! Strange when most manufacturers making dog clippers sells them with a blade! Oster GM #6 wide – 4.8mm med. Oster GM #7 wide – 3.2mm med. Oster GM #10 wide – 2.4mm med. This clipper also takes blades from the AESCULAP/MOSER/OSTER/LAUBE/THRIVE/WAHL detachable A5 type blade ranges. Whilst we make every effort to update details when received from manufacturer's the actual goods delivered may deviate from the information given or images as supplied on this web page as a result of special versions, utilization or additional ordering options, or as a result of latest technical upgrades.